I still find having preserves with your cheese to be quite a new and exciting concept. 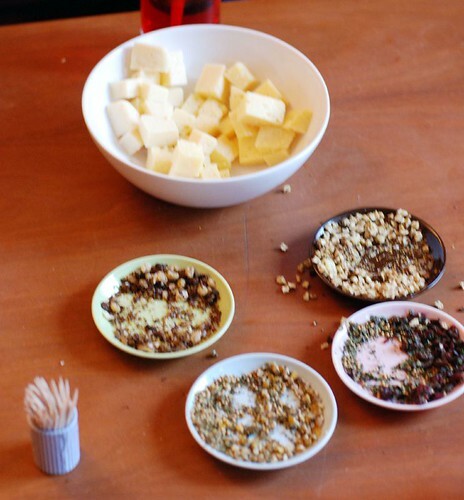 Falbygdens, a cheese producer, is taking it to the next levels with these cheese toppings. They're released five flavors (pear-truffle, strawberry, orange, fig-truffle and honey-truffle) and they mostly consist of dried fruit, mustard seeds and spices. What you do is dip your cheese in it - or actually, try to cram as much of the things on top of your cheese, because it doesn't stick very well. Tasty? Um, sure. Not bad. But I really find it more of a novelty. Honey-truffle was my favorite, by the way. I wish I had more of an idea what you're talking about - and I don't mean that offensively. Tell us more, it sounds interesting! Sounds good. I wonder if you can make your own versions too. Cheese goes with everything in my opinion. They've made spice powder, essentially, which they supply with the cheese. You are to dip the cheese in the powder and eat it. I prefer preserves like marmelade or mostarda instead. In Florence last year I tried pecorino dipped in honey packed with slices of white truffles. One of the most delicious combinations ever! So I can see why you liked the honey truffle topping.